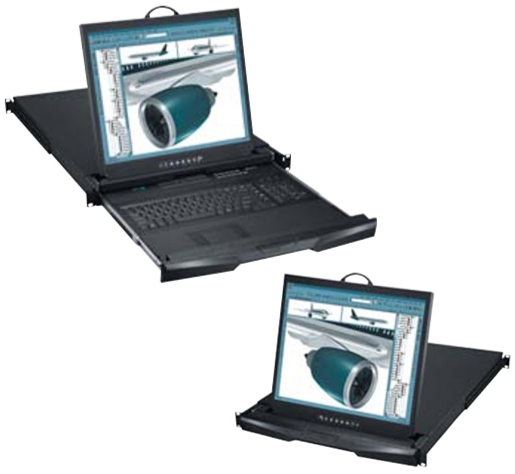 The W119 is a 1U Rackmount LCD Monitor with 19" LCD. The keyboard is a 104 key notepad keyboard with touchpad or trackball. The W119 series is also known as the W-119. The W119e comes with an integrated touchpad, while the W119b comes with an integrated trackball. Question: Good afternoon, is it possible to have the keyboard also with German and French layout? The CyberView W119 console is not modular, but the similar Raloy RWX119 is offered in 13 separate international keyboard layouts (including German and French keyboard layouts). To order the RWX119 with a German or French keyboard, please feel free to contact your KVM Switches Online sales representative. Question: Will this work with Blackbox DCX3000-DVR? The W119 should indeed be compatible with the BlackBox DCX3000-DVR remote user station using DVI and USB-HID outputs. To support 3.5mm audio, please make sure to select the [-AU] audio option for the W119 as well. Question: I have used the W119e, but have ordered a W119e with HDMI option. The spec on website and brochure indicates the Cyberview W119 (single console) has a depth of 460mm. Would you please confirm if the W119 with HDMI option has the same depth (460mm)? It's a great question; Unit depth is different, W119 with HDMI is 500mm (19.7").